It is a great family car and very reliable. My Honda Odyssey is an extremely reliable car. We have driven it cross country several time. We have kept it up with regularly scheduled maintenance and have never had any unusual issues. It is a smooth ride. I love the storage in the back. I can fit so much in it both for our vacations or shopping. I like that the middle seats can be removed as well as the back seat folding in. You can also flip the back bench so you can have seating if you tailgate. I did not get a TV screen but that would have been great when kids were younger. Now that kids are older it is great having a cig plug adapter in the back of the car as well as the front. There is also plenty of cup holders for a seven passenger car as well as roomy feeling. The best family car anyone could ask for! I absolutely love my Odyssey! It has been an amazing family car for us. It has been reliable, comfortable and given us the space and room we have needed in just going around town to going on vacations. I am seriously going to be heartbroken when it does not work for me anymore. The only issue that I have had with it is, there was a recall on the airbags a couple of years ago. It was fixed simply by taking it to the dealer and they made it very easy and accessible to do so. I would highly recommend this van to any buyer. The spaceship: a van that fits your every need. I bought this car used from a family friend after another car got totaled. I joke around and call it my spaceship, but the car is roomy and comfortable. It has been super helpful when it comes to moving because it can fit so many items in the truck with the foldable seats. I have had many maintenance issues, but I believe it is due to wear and tear. The van currently has over 180, 000 miles on it, so it is a good investment. 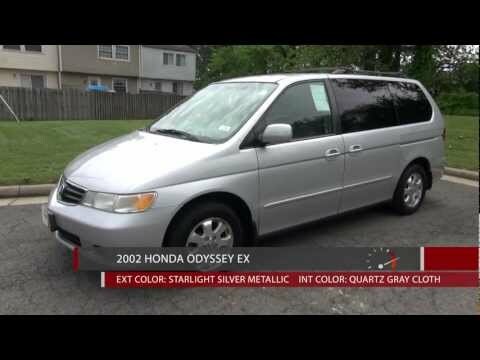 2002 Honda Odyssey EX - Walkaround, Review, and Test Drive. In the event of a crash necessitating deployment of the passenger's frontal air bag, the inflator could rupture with metal fragments striking the passenger seat occupant or other occupants possibly causing serious injury or death. Honda will notify owners, and dealers will replace the passenger air bag inflator, free of charge. The recall began on July 1, 2015. Owners may contact Honda customer service at 1-888-234-2138. Honda's numbers for this recall are JS1 and JS2. Note: Vehicles that have already received a replacement passenger air bag inflator as part of the recall remedy for an earlier campaign such as 14V353 or 14V700 (Honda recall numbers S95, JH6, JH7, JH8, JH9, JJ0, JJ1, JJ2, JJ6, JM5 and JM6) are not included in this recall. However, this recall does supersede 13V132 and 14V349. Note: On December 18, 2015 Honda informed NHTSA of an expansion of this recall to include certain model year 2004 Honda CR-V vehicles in addition to additional model year 2003 CR-V vehicles. American Honda Motor Company (Honda) is recalling certain model year 2002-2003 Civic, CR-V and Odyssey vehicles, and model year 2003 Accord, Element, Pilot, and Acura MDX vehicles to address a safety defect in the passenger side frontal air bag which may produce excessive internal pressure causing the inflator to rupture upon deployment of the air bag. In the event of a crash necessitating deployment of the passenger's frontal air bag, the inflator could rupture with metal fragments striking and potentially seriously injuring the passenger seat occupant or other occupants. Honda will notify owners, and dealers will replace the passenger air bag inflator, free of charge. Owners may contact Honda customer service at 1-800-999-1009. Note: This is an expansion of NHTSA Recall No. 13V-132. American Honda Motor Co. (Honda) is recalling certain model year 2001-2005 Honda Civic, 2003-2004 Civic CNG and Element, 2002-2005 CR-V, 2002-2004 Odyssey, 2003-2005 Accord, Pilot, Civic Hybrid, and Acura MDX, 2005 Acura RL and 2006 Honda Ridgeline vehicles originally sold, or ever registered, in geographic locations associated with high absolute humidity. Specifically, vehicles sold, or ever registered, in Alabama, Florida, Georgia, Hawaii, Louisiana, Mississippi, South Carolina, Texas, Puerto Rico, U.S. Virgin Islands, Saipan, Guam, and American Samoa are addressed by this recall. Upon deployment of the passenger side frontal air bag, excessive internal pressure may cause the inflator to rupture. Honda will notify owners, and dealers will replace the passenger side air bag inflator, free of charge. The recall is expected to begin on November 24, 2014. Owners may contact Honda customer service at 1-800-999-1009. Honda is recalling certain model year 2001-2003 Civic, model year 2002-2003 CR-V, and model year 2002 Odyssey vehicles to address a safety defect in the passenger side frontal air bag which may produce excessive internal pressure causing the inflator to rupture upon deployment of the air bag. This recall addresses both the passenger side frontal air bags that were originally installed in the vehicles, as well as replacement air bags that may have been installed as replacement service parts. A replacement air bag may have been installed, as one example, if a vehicle had been in a crash necessitating the replacement of the passenger side frontal air bag. Owners of all vehicles on which a defective air bag may have been installed either as original equipment, or as a replacement, will be notified. Dealers will inspect vehicles, and where a defective air bag inflator is identified, the inflator will be replaced, free of charge. The safety recall began during May 2013. Owners may contact Honda automobile customer service at 1-800-999-1009. Honda's recall campaign number is S95.